If you’d like to take a chance to receive a free e-book or print version of The Highlander’s Stolen Heart head on over to Cat’s Reviews or Kimi’s Medieval Author Interview Blog. Love your series; you come to know and love each of the characters. 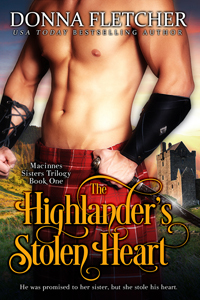 Enjoying the Highlander’s Stolen Heart and already hating that when I’m done I have to wait for Heather and Patience’s stories…really well done! I am so excited about the new book. I have been checking regularly Amazon to see if and when a new book by Donna was coming out, and no luck. I would really like to be notified when a new book comes out, because I will buy it. Can’t wait to start reading!! Keep up the good work. I really love ur books. Enjoy the people u write about. The story u tell.